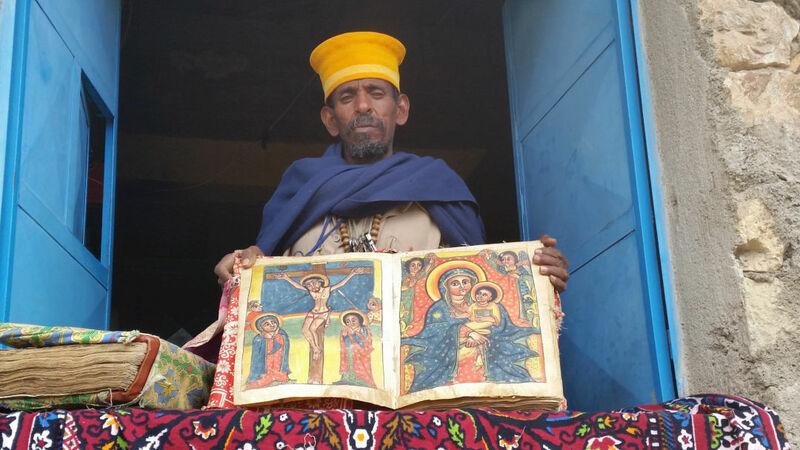 In Ethiopia, a Search for the Lost Ark – Satenaw Ethioopian News & Breaking News: Your right to know! The Chapel of the Tablet in Aksum, Ethiopia claims to be the final resting place of the Ark of the Covenant. SOME OF MY FRIENDS CHIDE ME ABOUT MY WORLD TRAVELS and jokingly refer to me as Indiana Jones. Maybe it’s the hat I wear when I’m traveling, my bizarre adventures or the seemingly near-death experiences I always seem to escape from unscathed. If you saw Raiders of the Lost Ark, you probably know Indiana Jones had to journey across the world to get near the Ark of the Covenant, and still never really saw it. Well, that’s now one more thing we have in common! Ethiopians claim that the ark was never lost, as is believed by most historians, but has been in their country for centuries. Whether that’s true or not is a matter of great speculation. According to legend and many historical records, the Queen of Sheba journeyed from Ethiopia to Jerusalem where she met King Solomon. One thing led to another and after Sheba returned to her country, their son Menelik I was born. Menelik traveled back to Jerusalem to meet his father some years later and was accompanied on his return journey to Ethiopia by some Israelite “first born” escorts. Unbeknownst to Menelik, his traveling companions “borrowed” the sacred Ark of the Covenant from Solomon’s temple. Menelik’s initial anger transformed into a resolution that this was all a part of God’s plan, or otherwise such a thing would not have been possible. 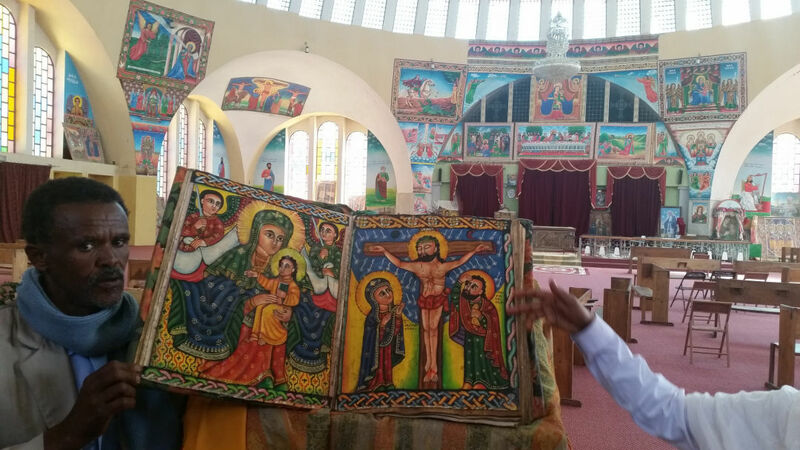 An Ethiopian priest in Aksum shows an illuminated manuscript featuring Jesus on the cross and being cradled as an infant by Mary. Ethiopians claim that for thousands of years, the ancient vessel containing the “First Edition” of the Ten Commandments has been carefully guarded by the descendants of Menelik. The successive kings were all descended from the same lineage of Solomon and Menelik until the last king of Ethiopia, Haile Selassie, who met his demise at the hands of the Derg in 1975. The capital of the kingdom has moved to several cities since, and the ark followed—until it was moved to its present location of Aksum in the northern highlands of the country. No one is allowed to see the ark except for the sole guardian and protector of the holy relic. Even the leader of the Ethiopian church is not allowed admission. One person is appointed to guard the ark and stays within its shrine until his death. Sound familiar? Maybe a little like the Indiana Jones movie where the one knight is guarding the Holy Grail? I’m not saying Steven Spielberg borrowed an idea or two from Ethiopian history, but rather he might have just stolen that whole bit. So, how do you get close to the ark of the covenant? First, you’ve got to fly to Ethiopia. It’s easier than you think, with a stopover in Germany or Paris and then on to the capital, Addis Ababa. Even though Ethiopia is situated in the most volatile region of the planet, next to countries such as Yemen, Somalia and Eritrea, the country is very stable, the people are extremely peaceful, and Christians make up nearly two-thirds of the population. That statistic might come as a surprise for many, but Ethiopia was the second country to adopt Christianity and is today one of the most devoutly Christian countries in the world. Many of the ancient temples are still in use and biblical verses painted on goat skins centuries ago are still read by the devout. 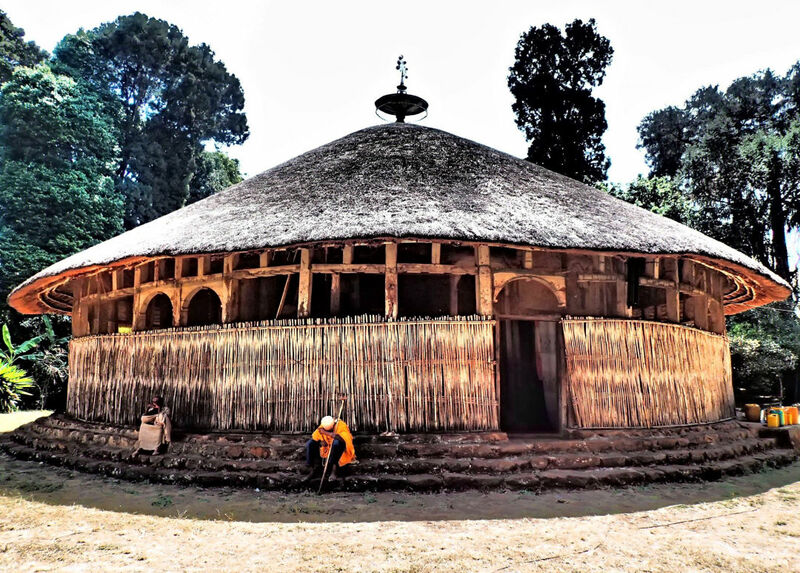 Monasteries such as this, on the Zege Peninsula of Lake Tana, were built between the 14th and 17th centuries. You could begin your journey in Bahir Dar, on Lake Tana. It’s an hour flight from Addis or a grueling 10-hour bus ride. Take the plane: Flights with Ethiopian Airlines are relatively inexpensive and much more pleasant than overland travel. Lake Tana is one of the two sources of the Nile, so theoretically, you could get in a boat and sail all the way to the Mediterranean, if not for the borders and dams in your way. What’s also special about Lake Tana is that the ark was supposedly hidden on one of the islands for 400 years. It was moved hundreds of years ago, but you can visit the monastery island of Tana Qirqos (as long as you’re not a woman) and walk the grounds where the holy object was allegedly kept from would-be marauders. You can hire a boat and visit several of the monasteries on the various islands, see a few hippos, and buy some interesting souvenirs. You won’t see the ark, but you’ll see many stories painted centuries ago adorning the walls that recount biblical and mythological stories from the past. From Bahir Dar, you fly to Aksum. Aksum is the northernmost city in Ethiopia. It was the center of the Ethiopian kingdom between 100 and 940 A.D. and has several worthwhile places to visit. The monolithic stelae are reminiscent of Egyptian obelisks. You’ll also find a natural pool where Sheba supposedly swam and King Ezana’s tablet, the Ethiopian equivalent of the Rosetta stone. Inside the “new” church of St. Mary of Zion, built in the 1950s. Taking up the main center of town is St. Mary of Zion, a church built in the 1960s that seems much older. It’s made up of several buildings, the most famous of which never gets visited by anyone. It’s a small chapel surrounded by barbed wire and security. Only one man is allowed in The Chapel of the Tablet and he is not allowed to leave the grounds until his death. And that’s where your journey ends. You’ll never get any closer to the Ark of the Covenant than this, so enjoy! You can stand in front of the building, take a selfie with the famous chapel, and hope that the Ark doesn’t melt your face like the Nazi bad guy in Indiana Jones. Is it really in there? Who knows? No one will be able to dispute your claim because there is no proof that it’s there and there’s no proof that it’s not there. I suppose if enough Ethiopians believe in it, however, you may as well believe in it too.